At Rouen in English-controlled Normandy, Joan of Arc, the peasant girl who became the saviour of France, is burned at the stake for heresy. Joan's village of Domremy lay on the frontier between the France of the Dauphin and that of the Anglo-Burgundians. In the midst of this unstable environment, Joan began hearing "voices" of three Christian saints – St. Michael, St. Catherine, and St. Margaret. When she was about 16, these voices exhorted her to aid the Dauphin in capturing Reims and therefore the French throne. In May 1428, she travelled to Vaucouleurs, a stronghold of the Dauphin, and told the captain of the garrison of her visions. Disbelieving the young peasant girl, he sent her home. In January 1429, she returned, and the captain, impressed by her piety and determination, agreed to allow her passage to the Dauphin at Chinon. Charles furnished her with a small army, and on 27 April 1429, she set out for Orleans, besieged by the English since October 1428. On 29 April, as a French sortie distracted the English troops on the west side of Orleans, Joan entered unopposed by its eastern gate. She brought greatly needed supplies and reinforcements and inspired the French to a passionate resistance. She personally led the charge in several battles and on 7 May was struck by an arrow. After quickly dressing her wound, she returned to the fight, and the French won the day. On 8 May, the English retreated from Orleans. During the next five weeks, Joan and the French commanders led the French into a string of stunning victories over the English. 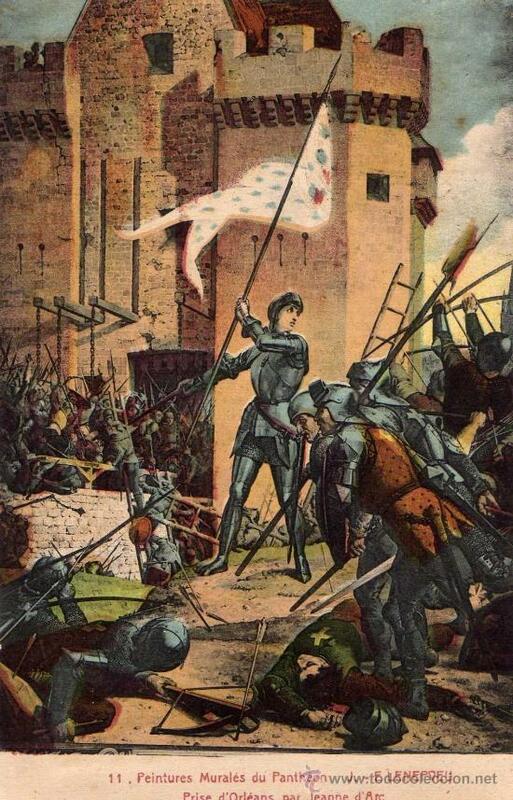 On 16 July, the royal army reached Reims, which opened its gates to Joan and the Dauphin. The next day, Charles VII was crowned king of France, with Joan standing nearby holding up her standard: an image of Christ in judgment. After the ceremony, she knelt before Charles, joyously calling him king for the first time. On 8 September, the king and Joan attacked Paris. During the battle, Joan carried her standard up to the earthworks and called on the Parisians to surrender the city to the king of France. She was wounded but continued to rally the king's troops until Charles ordered an end to the unsuccessful siege. That year, she led several more small campaigns, capturing the town of Saint-Pierre-le-Moitier. In December, Charles ennobled Joan, her parents, and her brothers. In May 1430, the Burgundians laid siege to Compiegne, and Joan stole into the town under the cover of darkness to aid in its defence. On 23 May, while leading a sortie against the Burgundians, she was captured. The Burgundians sold her to the English, and in March 1431 she went on trial before ecclesiastical authorities in Rouen on charges of heresy. Her most serious crime, according to the tribunal, was her rejection of church authority in favour of direct inspiration from God. After refusing to submit to the church, her sentence was read on 24 May: she was to be turned over to secular authorities and executed. Reacting with horror to the pronouncement, Joan agreed to recant and was condemned instead to perpetual imprisonment. Ordered to put on women's clothes, she obeyed, but a few days later the judges went to her cell and found her dressed again in male attire. Questioned, she told them that St. Catherine and St. Margaret had reproached her for giving in to the church against their will. She was found to be a relapsed heretic and on 29 May was ordered to be handed over to secular officials. On 30 May, Joan, 19 years old, was burned at the stake at the Place du Vieux-Marche in Rouen. Before the pyre was lit, she instructed a priest to hold high a crucifix for her to see and to shout out prayers loud enough to be heard above the roar of the flames. As a source of military inspiration, Joan of Arc helped turn the Hundred Years War firmly in France's favour. By 1453, Charles VII had reconquered all of France except for Calais, which the English relinquished in 1558. 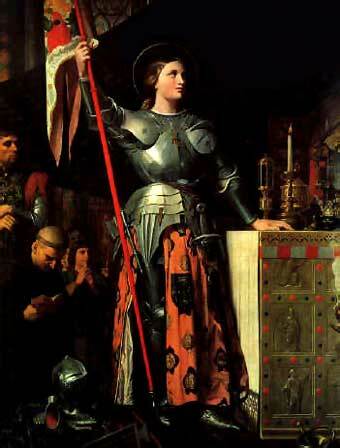 In 1920, Joan of Arc, one of the great heroes of French history, was recognised as a Christian saint by the Roman Catholic Church. Her feast day is 30 May. (Domrémy, Francia, 1412 - Ruán, id., 1431) Santa y heroína francesa. Nacida en el seno de una familia campesina acomodada, la infancia de Juana de Arco transcurrió durante el sangriento conflicto enmarcado en la guerra de los Cien Años que enfrentó al delfín Carlos, primogénito de Carlos VI de Francia, con Enrique VI de Inglaterra por el trono francés, y que provocó la ocupación de buena parte del norte de Francia por las tropas inglesas y borgoñonas.